LAS VEGAS (AP) — The gunman behind the deadliest mass shooting in modern U.S. history led a secret life that has so far thwarted investigators trying to figure out a motive for the attack. In an effort to try to crack Stephen Paddock’s state of mind, the FBI spent hours on Wednesday interviewing his longtime girlfriend, who returned Tuesday from a weekslong overseas trip and said she had no inkling of the massacre he was plotting when he sent her to see family in her native Philippines. “He never said anything to me or took any action that I was aware of that I understood in any way to be a warning that something horrible like this was going to happen,” Marilou Danley, 62, said in a statement read by her lawyer outside FBI headquarters in Los Angeles. Clark County Sheriff Joseph Lombardo said it’s difficult to believe Paddock acted alone in the attack Sunday that killed 58 and injured nearly 500 people at a country music concert on the Las Vegas Strip. Danley, whom authorities had previously called “a person of interest,” had been expected to provide insight into the mind of Paddock, a frustratingly opaque figure who carried out his high-rise massacre without leaving the plain-sight clues often found after major acts of bloodshed. Lombardo said Wednesday that Paddock had 1,600 rounds of ammunition and several containers of an explosive commonly used in target shooting that totaled 50 pounds (23 kilograms) in his car. But it wasn’t clear what, if anything, Paddock planned with the explosives, he said. 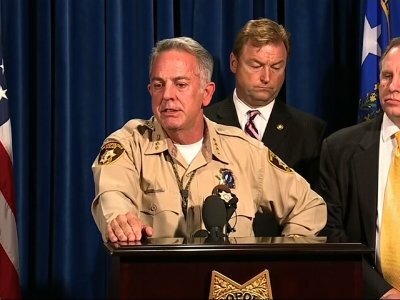 Paddock, who set up surveillance cameras in his room and to see anyone approaching outside, also had an escape plan, Lombardo said, though he fatally shot himself as police closed in on his luxury suite on the 32nd-floor of the Mandalay Bay resort casino. Lombardo declined to say what led authorities to believe he planned an escape. The previous weekend, Paddock had rented a high-rise condo in a building that overlooked the Life is Beautiful alternative music festival featuring Chance the Rapper, Muse, Lorde and Blink-182, said Lombardo, who offered no other details about what led Paddock there. On Sept. 28, the 64-year-old high-stakes gambler and real estate investor checked into Mandalay Bay and specifically requested an upper-floor room with a view of the Route 91 Harvest music festival, according to a person who has seen hotel records turned over to investigators. Paddock wasn’t able to move into the room until Saturday, said the person, who was not authorized to speak publicly and disclosed the information to the AP on condition of anonymity. The room, which goes for $590, was given to Paddock for free because he was a good customer who wagered tens of thousands of dollars each time he visited the casino, the person said. Paddock wired $100,000 to the Philippines days before the shooting, said a U.S. official who was not authorized to speak publicly because of the continuing investigation. Investigators are trying to trace that money. Danley, who was overseas for more than two weeks, said she was initially pleased when she was wired money from Paddock to buy a house for her family in the Philippines. But she later feared it was a way to break up with her. She said she loved Paddock as a “kind, caring, quiet man” and hoped they would have a future together. She said she was devastated by the carnage and would cooperate with authorities as they struggle to get inside Paddock’s mind. While Paddock had a passion for high-stakes gambling at Nevada casinos, his game of choice was video poker, a relatively solitary pursuit with no dealer and no humans to play against. And while neighbors described Paddock as friendly, he wasn’t close to them. Paddock had no known criminal history. Public records contained no indication of any financial problems, and his brother described him as a wealthy real estate investor. President Donald Trump and first lady Melania Trump met privately with victims at a Las Vegas hospital Wednesday and then with police officers and dispatchers, praising them and the doctors who treated the wounded. Melley reported from Los Angeles. Associated Press writers Regina Garcia Cano and Michelle Price in Las Vegas; Jim Gomez and Teresa Cerojano in Manila, Philippines; Andrew Dalton in Los Angeles; and Richard Lardner, Eric Tucker, Sadie Gurman and Tami Abdollah in Washington contributed to this report. For complete coverage of the Las Vegas shooting, click here: https://apnews.com/tag/LasVegasmassshooting . This story has been corrected to show that the death toll is 58, not including the gunman, based on revised information from the Clark County coroner.